Learn all about true ninja techniques and cultures during this private lesson with the master whose martial arts experience spans over 20 years. Among the skills you’ll learn from the master are from an introduction to ninja weapons as blowgun and ninja star among others. You will gain new perspective of ninja and a lot of knowledge of ninja. You will have an interpreter during the sessions so that you may enjoy smooth communications with the host. The place is only 5 minutes away from Shinjuku Station by train. In this real Ninja experience, train under a Ninja master with over 20 years of experience in martial arts and learn ninja techniques passed down through history. 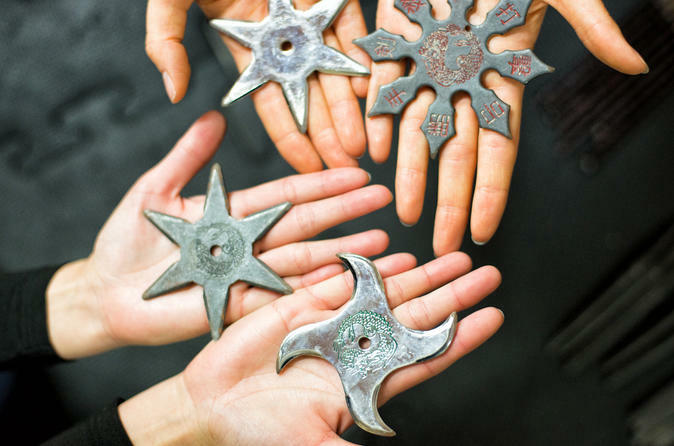 To begin, you will learn about the history of the “shuriken”, throwing ninja star, an iconic ninja weapon. After a lecture about how to throw shuriken, you will actually get the chance to practice throwing these deadly weapons. Your host for this ninja experience is the representative for the Seimyouryuheihounokai group and Modern Shiriken association. His masterful expertise will guide you through this hands-on ninjutsu workshop and leave with an in-depth knowledge of ninjas. This rare experience is not to be missed by anyone interested in martial arts or the history and culture related to ninjas.